I love both looks Mica - very simple yet so chic! I do adore your scarf and RM bag. They are the perfect outfit companions! I don't think I have ever seen an umbrella featured in your shots before, it looks so different! haha yes! I can usually time my photos around the rain, but it was so wet this morning I had no alternative than to get the umbrella out! Loving both of these pink bags! And I love the way they really complete your outfit and complement the colors you're wearing! The bags are super could mica and you styled them perfectly! I adore how you added in your converse sneakers with the last skirt Mica!! That's so modern and chic!! A peplum top with a pencil skirt is really a good pairing! How nice of your mother to gift this amazing peplum top to you that you show with the first look! I like both of the looks and think the second look is really perfect for a day working from home. Peplum is such a fun and feminine detail! I love the color combination and how you styled that first outfit. That pink bag is just gorgeous! Loving these looks! Looks great! Those outfits are cute! I really like the first set (especially that top) but the second is my favorite, and the Rebecca Minkoff bag in light pink is beautiful! I really love the second outfit - the sneakers really work with it! Happy week, Mica! 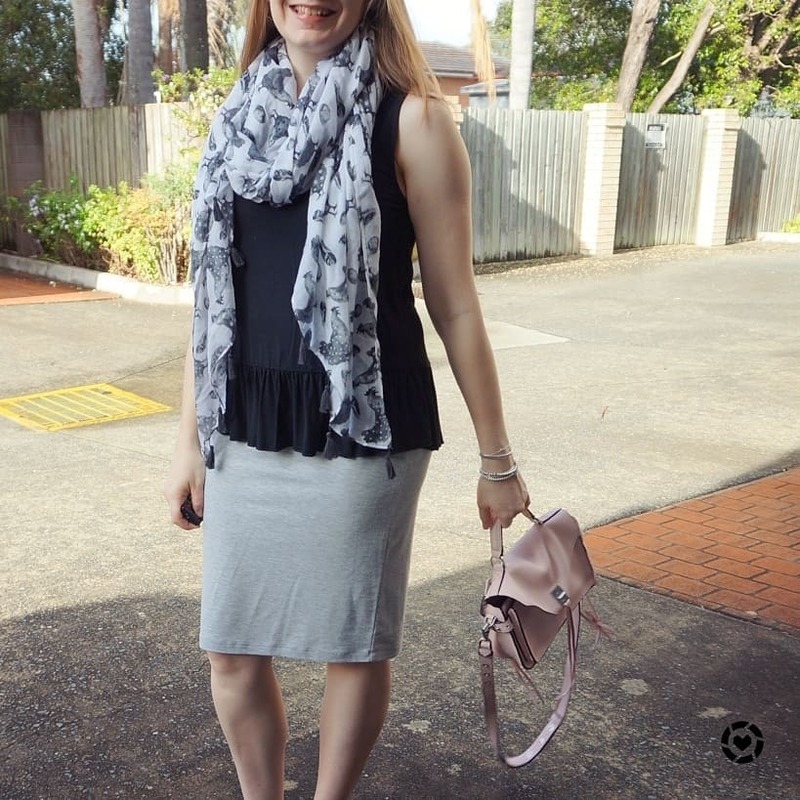 I’d love these two outfits that feature pencil skirts and the lovely peplum tops, you do an excellent job of showing how accessories really change an outfit. I love the tassel necklace and that beautiful scarf. I hope you and your family are well! That was so nice of your mom to buy you that tan top. Hope you have a great week. Its been a rainy one so far. These outfits are so professional, yet still so cute and YOU! 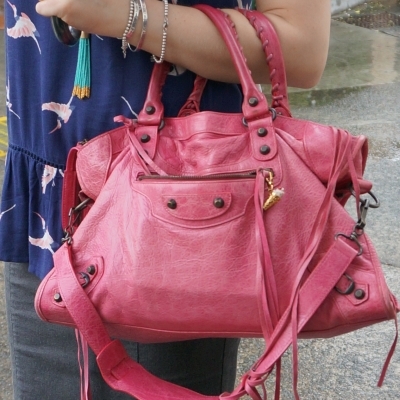 :) Love the pop of color with the pink bags! Your new tank is absolutely beautiful! I love the print of it! And you dressed down your pencil skirt so perfectly in the second outfit! Hope you are having a good start to your week! This is such a pretty combination. A pencil skirt is a classic and a peplum top is both elegant and fun. I love the result of combining them. It was so sweet of your mom to get it for you. Thanks Jeanne! I'm running out of ideas for hot to style my long hair for work, an easy ponytail is it, haha! Peplum is really classy... I loved the combination. It looks chic.. I love the print on that tank in the top photos - it's really cute. I always have been a big lover of pencil skirt. You have styled it with that lovely tank top. The second outfit is also perfect. Love the second outfit, the way you paired your sneakers with the skirt is fab, I need to wear my sneakers more often with skirts and dresses!! 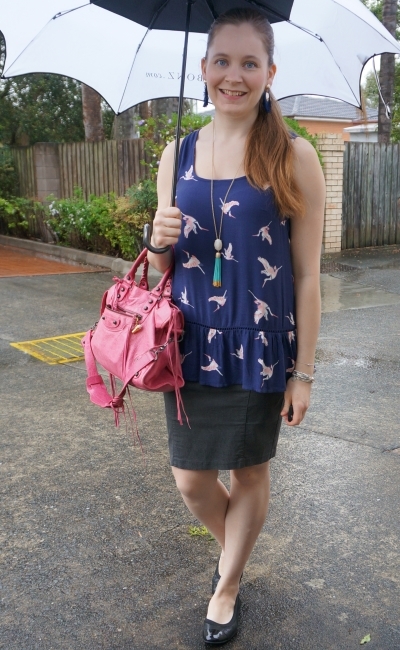 This tank in the first look is so cute, lady! Hope you have a great week! The pink bag is so nice, dear! I love both of those peplum tanks! The print of the first is so pretty, and I love how you styled the second one with the cute Converse sneakers and gorgeous pink bag. I have never seen a peplum tank! super cute, you rock it! I really like both of your outfit and your bags are so amazing. I love peplum details! That print on the first tank is beautiful. I absolutely love both tops and styles. The black and gray is my favorite. And I love the pink bag too. You look so pretty , Mica, and loved your both pink bags. That's crazy to see you with an umbrella, Mica, ha ha! I love the looks though, especially the scarves! Happy Thursday! haha yes it does rain here sometimes! 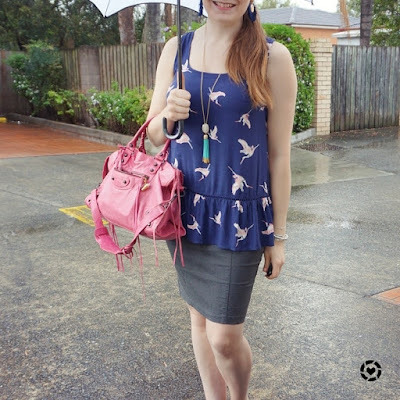 I always love that you show how you can wear something for both work and more casual days. The peplum tanks look great with the pencil skirts. The converse were a really great choice for the second outfit! Both outfits are stunning!!! Who knew peplum tops and pencils skirts are a match made in heaven? What pretty looks! I love how you style your scarves. 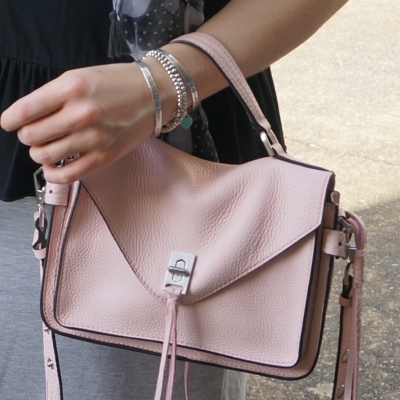 Beautiful outfit with the pink and grey, what a darling bag. I absolutely LOVE the second look with the pink, you look spectacular Mica.